Hello, and welcome to Roddy Reviews! We return to Middle-Earth as the time comes to tackle the Hobbit: The Desolation of Smaug! Firstly, this is definitely my favourite film in the trilogy. It's a more solid and fun film than the other two, with some amazing moments (with its own fair share of absolutely crap moments) that largely outweigh the crap. The action in this film is more stepped up from the last film, which was sort of lackluster in that area, and it's more believable than lots of the action in the next film. The CGI in this film is also much better than the other two, not quite looking realistic but certainly less cartoonish. However, there are also lots of changes from the book in this film, which is understandable, as it needs to be fleshed out enough to cover a feature film. That brings me onto another point; the scenes in this film have a smoother flow to them and don't feel dragged out as much. Although some parts like Laketown do go on for too long, but overall it's a much better film than the other two. The changes from the book are sort of hit-and-miss. I love Gandalf and the Necromancer, I think it's a good way of tying it into the Lotr trilogy and also making a lot of sense within this trilogy. Except Azog, he was pointless. Bolg could easily have been the main villain and it would work just as well, and make much more sense. Other changes don't work so well either. What they were going for with Tauriel and Kili completely falls flat on its face, but I shall get to that in a bit. Unlike the first film, there are also noticeable changes in the Extended Edition, enough for me to even change my Roddy Rating between the two. The Extended Edition is much better, giving us scenes more accurate to the book (especially those ones that people were complaining weren't there) and also makes the Necromancer stuff make much more sense. Again, I'll get to those in the detailed section. Smaug was just brilliant in this film. That's all I have to say on Smaug for now. Now, it's time to get into the SPOILER HEAVY DETAILED SECTION. Scroll down to the bottom if you just want my final rating. How did I find this. So, the film starts with a flashback to Bree, with ofcourse Pete's obligatory cameo of eating a carrot. A Bree scene wouldn't be complete without this, and an explanation isn't even necessary. Peter Jackson does what he wants. Anyway, Thorin enters the Prancing Pony, because Lord of the Rings reference, where he bumps into Gandalf. It then turns out that it's actually Gandalf who convinces Thorin to go on his quest to reclaim Erebor and all that. 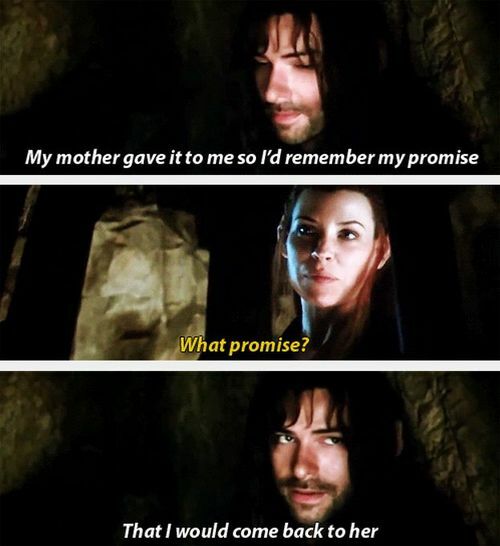 We then get several minutes of exposition which we've already either been told or figured out for ourselves, but in the Extended Edition (spoiler alert for that) we get several flashbacks to Thrain at the Moria battle, which 'subtly' begins an entire subplot that's only fulfilled within the Extended Editions. Cut to 12 months later as we come across Bilbo and co. during their journey, where they meet Beorn in his incarnation as a bear. He chases them back to his own house as he lets them stay for the night like a reluctant friend. "Alright fine you can stay round, ugh". In the theatrical version of the film, the Beorn scene seems somewhat brushed over and rushed, which is...certainly unlike a Hobbit Film. The Extended Edition however makes it both a more fun and enjoyable scene, but is also much more accurate to the book, and doesn't just include him as a temporary filler, but an actual character. Also, Azog basically gets replaced by Bolg as the villain for this film; Azog is summoned by the 'mysterious' Necromancer who wants him to be in charge of his army as a part of the bigger war. So yeah, say hey to Bolg! After spending the night with Beorn, our heroes are provided with ponies by him which they use to reach Mirkwood, which to their apparent surprise isn't a nice happy place anymore. Despite Radagast telling them specifically that the Greenwood was sick in the first film, but meh, maybe they just didn't bother listening to him. I wouldn't blame them. Gandalf then basically gives everyone the middle finger as he takes his pony and rides away to begin his own subplot (the Extended Edition also has some exposition between Gandalf and Beorn about Dol Guldur, which really makes the story more solid and makes more sense as to why Azog was resurrected. Although Bolg still makes the most sense.) Mirkwood seems to be a place widely hated in the films by the Tolkien fans, and I can see why. The background seems like a cartoon and not very threatening or sinister. But in my opinion, whilst it seems like this to start with, you can see the woods getting darker as they walk further in and it appears more like I envisioned it when reading the books. That's not to say it's accurate, because it isn't. Again, I prefer Mirkwood in the Extended Edition. It shows more of the effects on the characters and, well, them having to cross the river is pretty much exactly how it went in the book. Before they know it, our heroes are ambushed by spiders, and Bilbo being Bilbo, manages to wake up before everyone else. Not sure why, just because Bilbo. He then shows us the utter badass he is by managing to free himself (going invisible with the ring) and stabbing a spider, thus resulting in his 'letter-opener' (good motivation Balin) being named Sting. And I have to say, I enjoyed the spider sequence (minus the end of it, but all in good time) as it's pretty much how I pictured it in the book. Plus, the action is fun. Ugh. The cringe is too much. However, this is where the film reaches its low point. Introducing two characters that weren't in the book, Legolas and Tauriel. I understand why Legolas was put in the film, and even Tauriel to a point, but come on Pete, did they really have to become so centric to the plot? Legolas being there makes sense, due to him being the son of Thranduil, and Tauriel kind of makes sense because the film is a little bit top heavy with male characters. Not that a female lead is necessary to a good story, but in a minor role she can't do much harm. Sadly, she didn't have a minor role. She ended up being in a forced love triangle with Legolas and Kili. Yes. Legolas and Kili. Just...no. Firstly, isn't it funny that it ends up being Kili, the only Dwarf in existence that looks like a good-looking human. No, it isn't funny. Because it's obviously just fuel for mindless fangirls to get them in the seats. It just doesn't work. Kili's a Dwarf, and Tauriel's an Elf, so they're both contradicting the lore by having a romantic interest in each other. Legolas and Gimli's friendship worked because it hadn't happened in ages. It means a lot less when some good-looking Dwarf and forced-in Elf hooked up 60 years beforehand. Not every film has to be a love story. Anyway, so yes, our heroes get captured by Legolas and Tauriel and are taken to the Halls of Thranduil and the Wood-Elves. What are they actually called? Wait no, nevermind, there's probably a Tol Ki En member out there giving me a death sentence now. Thranduil himself is... not how I imagined him. The Halls of the Woodland Realm (I'm gonna call them that) look nice, but Thranduil himself is too...bland. I know he's meant to be a snobby Elven King, which Lee Pace does get right, but he just doesn't seem as wise as I envisioned. Maybe this is just a nitpick, since the Wood-Elves are famous for being less wise and more dangerous, but...I dunno, something about him seems too uninterested in everything. On the other side of the world, in the High Fells, we see Gandalf investigating a bunch of Tombs when Radagast arrives jumpscare-style. Thankfully, he's a lot more toned down in this film. Anyway, Gandalf reveals in a dramatic fashion ("one of nine") that the tombs in fact belong to the Nazgul, and they've been summoned to Dol Guldur by their master. At this point, if you haven't realised already, you're basically told Sauron is the Necromancer. What a reveal, am I right? No gif, but still just as bad. romance scene between Kili and Tauriel, where they fall in love in such a forced and cringeworthy way. Their dialogue is so boring, although it's meant to highlight the bridge they're building over their races. Except the bridge shouldn't be built! As I said, Legolas and Gimli were the first Elf/Dwarf friendship in years. That's why it was so focused on, and why they had such a rivalry. This just slaps that in the face over and over. Really bad scene. Eventually we cut to Bilbo using the ring to find the keys and break the Dwarves out, as we get to a really fun and well-choreographed fight/action scene. The barrel part didn't suspend your disbelief too much, it was certainly within the realm of realism and agreed with physics, but it did start to get cartoonish as soon as Legolas, Tauriel and the Elves started their fight with the Orcs. A fun action scene, but the Orcs part really deviated from the book, albeit to allow for a cool fight scene. I don't know, but I doubt Tolkien would approve. Sadly. An enjoyable scene nonetheless. And yes, I am going to mention Kili being shot in the leg with a Morgul Arrow. It's unnecessary drama and only acts to make Tauriel a more prominent lead character and whatevs. I hate Kili. After the fight scene, Legolas and Tauriel bring a prisoner back to Thranduil. This scene literally only exists to make Tauriel go after Kili. That is literally it. Laketown does look pretty cool. On the shores of the big inconvenient lake between them and Mt. Lonely (Yes I know that's not what its actually called), our heroes find a bargeman named Bard, who reluctantly takes them to Laketown. The heroes of Middle-Earth, ladies and gentlemen. Able to be bribed by a bunch of random Dwarves who were clearly attacked by Elves, the latter of which happen to be vital trading partners to Laketown. Way to go Bard. Anyway, our heroes get into Laketown...and nothing much really happens for the next half an hour. Especially in the Extended Edition. It draaaaaaags. There are a few comedic moments, but overall it's just filler and really slows down the story. I don't hate it though, it's certainly not at the point of boring, but lots of it just isn't necessary. Especially Alfrid and the Master. The roles of those two have been increased too much, again more so in the Extended Edition. I really can't be bothered to go too much into detail in Laketown as I have no proper opinion on it, and if you've got this far then you've seen the film and know what happens so I won't just narrate it. Basically, the Dwarves convince everyone that they won't screw up and they go on their way towards the mountain. though it isn't a prequel. Having connections is fine though, especially since it's a subplot and barely gets any screentime. Gandalf enters Dol Guldur in an epic fashion as we see that Dol Guldur is inhabited by a crap ton of Orcs, including Azog. In the theatrical version, Gandalf uses a bunch of spells to try and reveal the hidden stuff in Dol Guldur, which is cool in its own. However, the Extended Edition saves the day once again as it becomes much more lore accurate and expanding on the Thrain subplot from earlier. Gandalf finds Thrain and it turns out Sauron is collecting as many of the rings as he can. Not sure why, but whatevs; he can't control them without the one ring. Saruman even said that in the first one! And cut back to Thorin and the company. They finally reach the Desolation of Smaug (basically Dale, but that would be a much more boring title. "The Hobbit: What's left of Dale"). They find their way up the Mountain thanks to Bilbo, despite it not being hard to notice and try to get the hidden door open before the sun sets. Although, the sun sets and they all lose hope. Their quest has failed. Hahahahahah, as if anybody believed that for a second. Bilbo finds out it's actually the last moon of autumn, again, very accurate to the book; they could have just opened the door straight away. Thank you Pete. They go into the Mountain, share a genuinely moving scene where they talk about what it used to be like accompanied with slow music, and then give Bilbo the task of finding the Arkenstone. then the two run. They run across a bridge as one of the most epic scenes in the trilogy happens; Gandalf confronts Sauron. In the Extended Edition (spoiler alert) Sauron pulls Thrain into a vortex and kills him. It's then Gandalf alone against Sauron, and it is truly epic. The two get locked into a dark vs light battle, Sauron getting the upper hand a lot of the time. The battle sways back and forth for a couple of minutes, before Sauron manages to push back Gandalf's shield and out of the darkness, walks a figure, covered in flame. Gandalf clearly is no match for it as it literally disintegrates his staff, tossing him around like some kind of doll and showing how powerful he truly is. The figure then pins Gandalf against the wall with ease. If you weren't able to realise this was Sauron by this point, you definitely know it now. The camera zooms in on Sauron, as he suddenly reverses colour and shows what we all know and love; the eye wreathed in flame. Poor Gandalf seems a little overwhelmed as all he can manage is "Sauron". We then get some kind of Sauronception scene as we just see Sauron inside Sauron inside Sauron inside....you get the idea. Anyway, proper epic scene. I understand it may not be completely true to the lore because of Gandalf's magic limitations, but to be fair, all he was doing was generating a ball of light. He did the same in his fight against the Balrog. Aaaaand back to Bilbo. He starts searching through piles of gold for the Arkenstone, as he has no idea what it looks like (despite it being the reason he's there in the first place. Good job Gandalf and Thorin) until he accidentally causes lots of gold to fall down from a hill, revealing an eye. He tries to go round the other side but he sees a tail, now starting to move. Good job Bilbo. We get several moments of tension before the eye opens and gets up, revealing the complete amazingness that goes by the name of Smaug. He gets into a fun book-accurate title-naming contest with Bilbo "Barrel-rider" before showing himself in all his Dragon glory. Smaug was done brilliantly in this film. There are several Tolkien fans who didn't like the inaccuracies with the book in having the Dwarves have Smaug chase them around, and trying to defeat him and all that. But to be fair, in the books, after the first introductions, they all just sort of waited outside the Mountain until Smaug went off to Laketown. Imagine half an hour of that. So I can see why Pete did what he did. Plus, how can you hate Smaug. The CGI on him is just awesome. Especially when he breathes fire, he really does seem as menacing as he was in the book. Smaug seriously is the best part of the whole trilogy. He's so bloody epic. Without him the trilogy may as well not exist. Thorin then gets the idea of playing cat and mouse with Smaug to get to the forges and...do whatever. Their plan was kinda vague, not entirely sure why everybody went along with it. Nori thinks "We might have given him the slip", but Dwalin debunks that, saying he's too cunning. But then it turns out that's exactly what they did. I dunno, it just feels like the cat-and-mouse games kind of ruin everything previously said about Smaug. He was outsmarted easily and played right into whatever they wanted him to do. It's still cool, and he still remains just as threatening but I just feel like he was outsmarted way too easily. So the Dwarves with their cat and mouse tactics manage to lure Smaug to the forges (which they use him to light. Actually a pretty clever plan to be honest). They then melt a bunch of gold and Thorin rides the stream of unrealistic-looking gold. Yeah, um, I doubt he would be able to do that. Anyway they end up making a statue of gold which melts and engulfs Smaug. The Dwarves think they've defeated him then wham he jumps out, making a beeline for Laketown. I am also going to give the Desolation of Smaug Extended Edition an 8/10, due to more fleshed out characters like Beorn and and more general accuracy to the book, like Mirkwood. Whew, that review took way longer than the first one. Thanks for reading and I'll see you in the conclusion to the Hobbit trilogy!